Seems a shame to prune a rose when it's at peak bloom. And in the case of some climates that time is during winter! I’ve written a few blog posts talking about pruning in a climate where you have a true winter – one where the roses go fully dormant. We talked about not pruning too early because it risks pushing new growth that could be harmed in a freeze, and we talked about using when the forsythia bloom as a guide to know when it’s safe to prune. But when should you prune if you live a climate with no dormant season? Particularly in a season with a hot summer and no winter to speak of. Well, that’s what this post is about! When I lived and gardened in Los Angeles, California we used to prune our roses in late December to late January. While the roses didn’t go dormant, the shorter days did slow them down and Los Angles would get some cool nights. So when asked by gardeners who live in a non-dormant climate when they should prune their roses I generally said December or January and figured it applied to everyone. Recently I was in Tampa, Florida at a convention of the Deep South District of the American Rose Society and the subject came up. Several of the attendees who were from Florida had a different take on the “when” of pruning roses in a hot climate. That’s right, summer. Here is why. For them the best rose season is actually during “winter”. The months of October through April or so. Because the days are cooler the roses grow well, the blooms are larger and the colors deeper. To them it seemed a real shame to prune in December or January just when the roses were at peak season. Plus, how nice to have roses over the Holiday! Instead they felt it would be best to prune their roses in late summer when the heat shuts the roses down and they don’t look their best. A few of them tried this with great success and the idea is catching on. I’ll admit it took me a while to wrap my head around it but it really did make a lot of sense. I think this will work well if you live in a climate with hot summers and winters that rarely get down into the forties (5 C) – even at night. Another way you can determine if this works for you is observe your roses over the next month or so. If they are growing well, pumping out blooms and generally seem happy then think about waiting to prune until the dog days of July/August. If you roses are out of control and need some trimming right now because this is when you normally prune, do a light shaping now and the “pruning” over the summer. I bet some of those blooms will look great on the Christmas Tree! 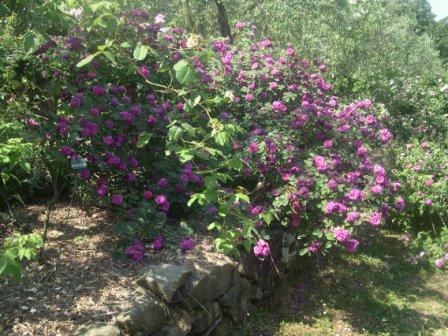 Originally published on the Roses Are Plants, Too blog at Fine Gardening Magazine.